Drink in the terminology, history, and science of wine with this cotton tea towel. Whether you're a professional oenologist (a scientist who studies wine), or just dreaming of a $160,000 bottle of 1787 Chateau Lafite (believed to be from the cellar of Thomas Jefferson) this towel is a smart pairing with your favorite bottle of vino. 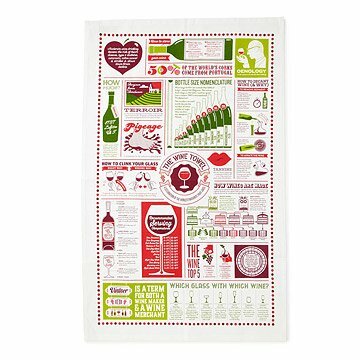 Showcasing a vibrant infographic with wine varieties, history and more, this cotton wine towel provides intriguing reading material, with warm notes of playfulness and intellect. Made in the UK. Perfect little gem to either use as a regular hand towel or decor for your kitchen (my friends decided to hang it in their kitchen. The wine tea towel is a great gift...both a conversation starter and a gift that can be used! Was received positively by the recipient of the gift. I bought this as a gift for my son who is becoming a wine lover. Hes already a great cook. This is a fun and informative themed gift. Our son opened a wine, spirits and beer bar, and we thought this was a really cool idea for him for Christmas. The towels are great quality and the printing was awesome. Perfect Christmas Gift for members of our Wine Club! This is an adorable addition to my home. We are big coffee drinkers here and it suits us. This is a nice decorative towel for any wine afficianado. The artwork is fun and folky and it was a perfect gift! I got this as a gift for my mom, and she loves it! She spent a lot of time reading through the facts on it and plans to use it to wrap the wine bottles in for future parties. The print and material are good quality.